Below are a list of blogs that I read regularly - like, daily - for inspiration and entertainment. If you're looking to expand your reading list, do check some of these out! Carrots 'n' Cake - Healthy living, foodie, fitness, running, recipes. Every Other Moment- Parenting. Beautifully written. Girl's Gone Child - Parenting, twins, style, SoCal blogger. Beautifully written. Gluten Free Girl - Recipes (gluten-free), foodie, parenting, life. Beautifully written. A Healthy Slice of Life - Healthy living, fitness, parenting. Healthy Strides - Weight loss, running, parenting. Healthy Tipping Point - Healthy living, pregnancy, running, life. Kath Eats Real Food - Foodie, healthy living, life. love Taza - Style, life, parenting, pregnancy. Mile Posts - Running, parenting. My Brown Baby - African American issues, parenting. (neverhome)maker - Recipes (vegetarian), running, parenting (former pregnancy), life. No Gluten, No Problem - Recipes (gluten free), running (ultra), Gluten free education. Run Eat Repeat - Running, weight loss, healthy living, SoCal blogger. Sassy Molassy - Running, healthy living. Sweat Once a Day - Running. This Runner's Trials - Running, fitness, parenting (former pregnancy), life. 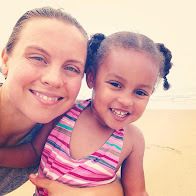 White Sugar, Brown Sugar - Transracial adoption, African American, parenting. The Wilde Heart - Art, pregnancy, recipes, life, SoCal blogger.